G Mail uses the Google account credentials to authenticate and log you in, Basically Both Google and Gmail account are same both have the same user name as well as password too same, you have to know the current password and username to change it to further. If even you don’t remember your current Gmail password you might still have a chance to change password by answering the security question set when you registered it. 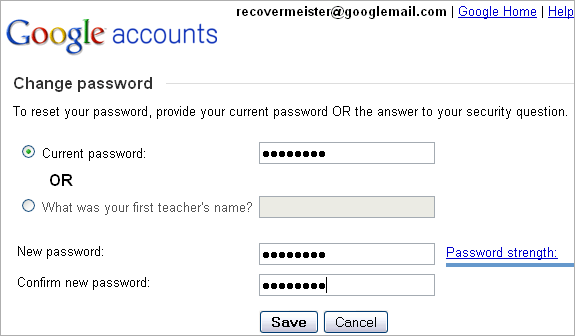 This article guide you how to change password of google or Gmail. Simply you need to follow the below steps. Open Google and click on the right corner top of the page, In the drop down list you will find the Account option click on the it will goes to account management page. navigate the security option in that page and click on that, There you will find an option called change password. Now click on that option to change password. Enter your current email address and security question, If you don’t know both then you have to recover your old G mail password for emergency purpose. After changing the password you will get a message that new password saved successfully. That’s it you are done with changing the old password to the new One. If you want you can check the mail by opening it with new password.